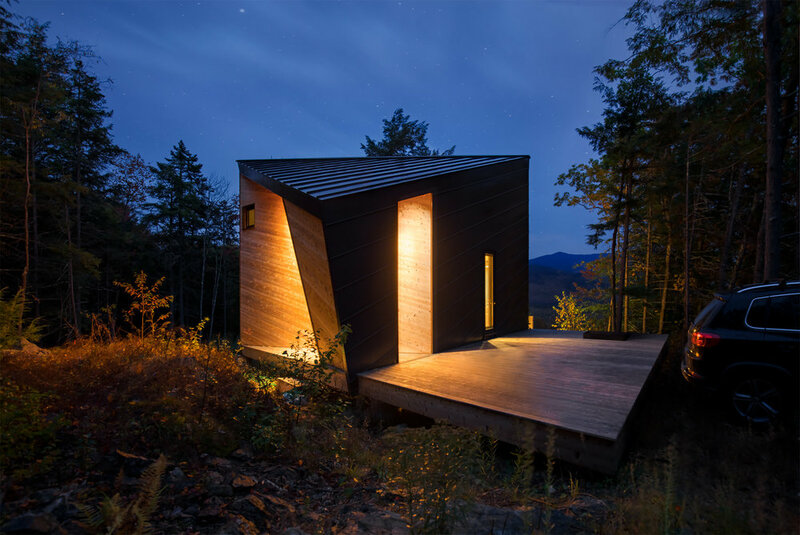 The cabin is perched on a granite outcropping in the White Mountains. It was sited to cantilever precariously over a steep drop-off, allowing dramatic views across the valley at several prominent peaks. Instead of leveling the granite ledge, the topography is embraced; the structure is lifted on 9 hand-poured concrete footings - a system selected in order to tread lightly on the sloped site. Working with Fire Tower Engineered Timber and Bensonwood, all framing elements were engineered and pre-cut before being delivered to site wrapped, labeled, and ready for assembly. This approach of modular prefabrication shortened construction time and reduced site-disturbance. Minimal trees were cleared to provide specific views through a 24ft wide sliding glass wall by Architectural Openings. The cabin was initially conceived as a weekend getaway for 2. However, during the course of the design process, the 2 grew to become a family of 3, then 4. The growing needs of the family required maximizing the footprint while responding to the strictly limited availability of granite on which to build. The faceted geometry of the cabin reflects this evolution - a form that is both elemental yet appears to be in constant transformation depending on one’s vantage point. It is shaped both by its surroundings and by its occupants, making a lasting connection between what is there and what is to come.